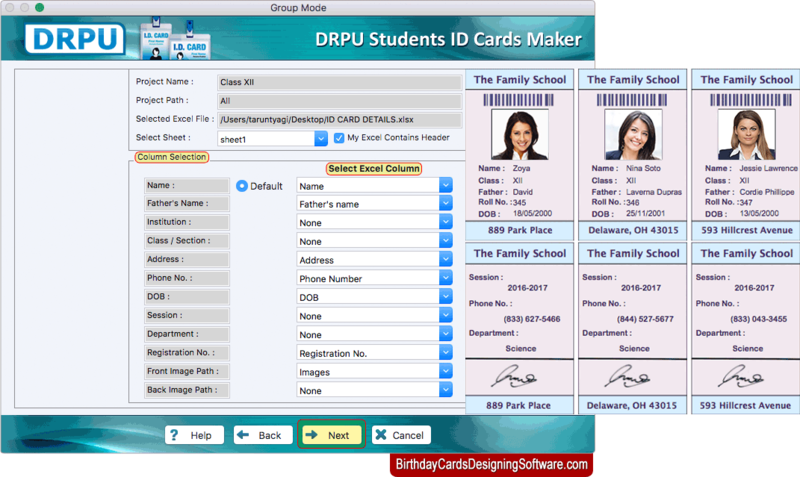 Students ID Cards Maker for Mac design and print multiple student ID cards by browsing all details of student ID Card from Excel file. You can add photo on id cards by browsing path of image or by taking photo of student using camera settings available in software. You can design and print single sided (Front) or double sided (Front and Back) ID cards. Software provides option to design and print double sided (Front and Back) id cards. Camera Setting is also available in software to capture photo of ID card user while designing ID Card. To add photo of student on your ID cards, you can crop single or multiple images using Image Cropping Tool, if required. You can export your designed id cards as template, as image and as PDF file format.